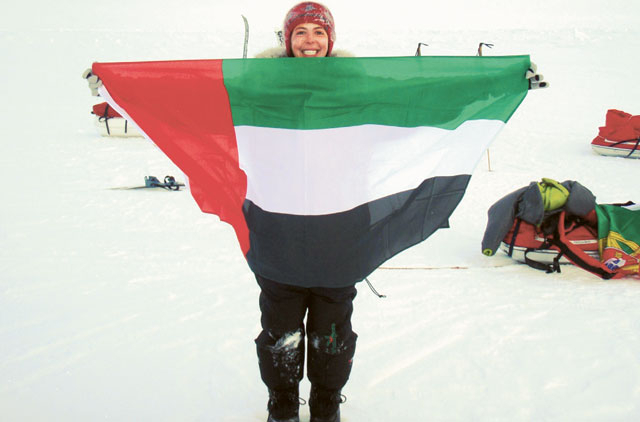 Dubai: Maria Conceicao, founder of the Maria Cristina Foundation, successfully completed her journey to the North Pole in an effort to raise funds and awareness for the MC Scholarship Programme. The programme provides the necessary funds to support the secondary education costs for six underprivileged Bangladeshi children in Dubai. Conceicao achieved the milestone on April 22 at 7.30pm UAE time, according to information released yesterday. "The journey to the North Pole was exciting and filled with challenges," she said. Even though temperatures remained favourable throughout the expedition, she had to manoeuvre across varying terrain, consisting of big pans of ice, rubble, pressure ridges, thin ice and huge blocks of moving ice. On the day Conceicao reached her destination, she encountered near zero visibility several times. However, favourable temperatures of minus 10C enabled her to cover 9.5 nautical miles in six hours. The most tedious part of the journey was arriving precisely at the North Pole. The constantly shifting ice made it difficult to reach 90 degrees North and the destination lasted a split second, followed by a drift back to N89.95. Conceicao said: "The feeling you get when you reach the top of the world is indescribable. Even though it lasts only seconds till you drift back, the initial feeling is simply overwhelming and seems like it lasts a while. The expedition was all on schedule except at the end on the day we were supposed to return, as we encountered a huge delay in being picked up. There were times when I felt nervous, but having six great children to support and love gave me the inspiration to continue what I began courageously."